Delay of game. IFC has announced they’re pushing out the Brockmire season two finale by a week. The second season of Brockmire will now conclude on Wednesday, June 20, 2018 at 10:00pm ET/PT, with episode 2.08, “In the Cellar.” Meanwhile, during his week off, Jim Brockmire (Hank Azaria) live-tweet the NBA Finals on the official @BrockmireIFC Twitter account. An IFC dark comedy, Brockmire follows baseball announcer Jim Brockmire. Amanda Peet stars as minor league club owner Julia James, with Tyrel Jackson Williams as tech marvel, Charles. Katie Finneran and Hemky Madera return as guest stars in season two. Joining them are Becky Ann Baker, Carrie Preston, Dreama Walker, and Utkarsh Ambudkar. Get the skinny from this IFC press release. The final two episodes of IFC’s hit original comedy Brockmire will now air one week later than originally scheduled. After taking next week off – Jim Brockmire will be busy live-tweeting the NBA Finals game on Wednesday from @BrockmireIFC – an all-new episode, “Caught in a Rundown,” airs on Wednesday, June 13, while the Season 2 Finale, “In the Cellar,” airs the following week. Brockmire follows Jim Brockmire, a famed major league baseball announcer who suffered a notorious public breakdown after stumbling upon his wife’s infidelity – a breakdown so bad that “Brutal Brockmire” became a viral internet meme. 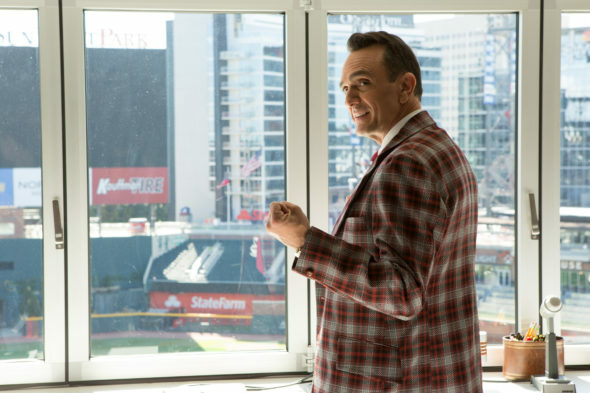 Season 1 began a decade later, as Brockmire looked to reclaim his career, reputation, and love life. He eventually found happiness calling games for the Morristown Frackers, the underdog minor league baseball team, alongside his girlfriend Jules (Amanda Peet). Season 2 kicked off one year later, with Brockmire chasing an opportunity to call games in New Orleans. He enjoys new found success as a top podcaster with his show “Brock Bottom,” while living with his co-dependent friend Charles (Tyrel Jackson Williams)… and partying harder than ever. Still trying to still reclaim his career as a major league sportscaster, Brockmire cannot resist the temptations of the Big Easy, while pining for the girl he left behind in Morristown, PA and struggling to find his purpose in life. Brockmire originally appeared as a viral short video on the award-winning comedy website Funny Or Die. Season 2 is directed by Mo Marable and executive produced by Azaria, Joel Church-Cooper, Marable, Tim Kirkby and Funny Or Die’s Mike Farah and Joe Farrell. Brockmire Season 1 is available to watch on Hulu, iTunes, Amazon, and IFC platforms. IFC renewed Brockmire for two additional seasons, slated to air in 2019 and 2020, respectively. What do you think? Are you a fan of the Brockmire TV series? What have you thought of the second season, so far?